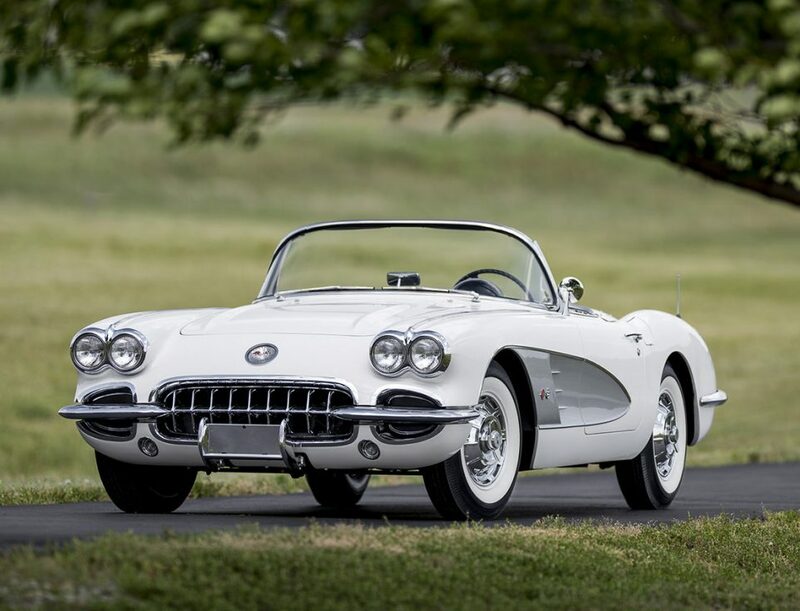 It’s hard to imagine that the Chevrolet Corvette is a car that almost never was; a car that was almost aborted before it had the opportunity to show the world what American style means. It is also a strange tale to tell that the Corvette was in part saved by GM’s rival Ford, and by the input of a Russian immigrant named Zora Arkus-Duntov. 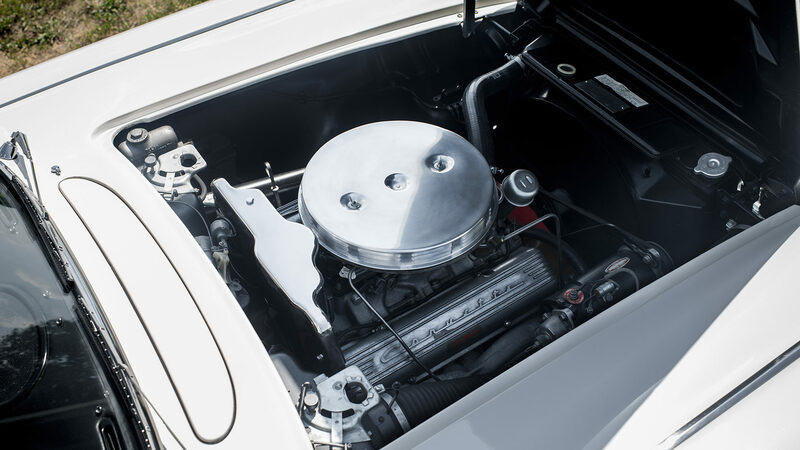 One of the things that helped save the Corvette was the fitting of a V8 engine. Early Corvettes had a rather unexciting six. GM’s initial decision to create a sports car can probably be blamed on the British. Back in the period just after the Second World War the British government told the car industry that they had to “export or perish” and so there was a flurry of activity to try to create cars that Britain could sell to Americans. Austin, mistakenly, concluded that what American car buyers wanted was a small and economical stylish “safe” car. So they created the Austin A90 Atlantic which Americans turned their noses up at. But the British cars that Americans did start buying were the sports cars such as the Jaguar XK120, and the Austin-Healey 100. American car maker Nash teamed up with British sports car maker Donald Healey to begin selling the Nash-Healey in the US in 1951 and as the sports car market began to demonstrate its viability the Executives at GM were able to be persuaded that they could create a worthy competitor to the British and European sports cars that were becoming increasingly visible Stateside; even American actor Clark Gable was driving a Jaguar XK120. 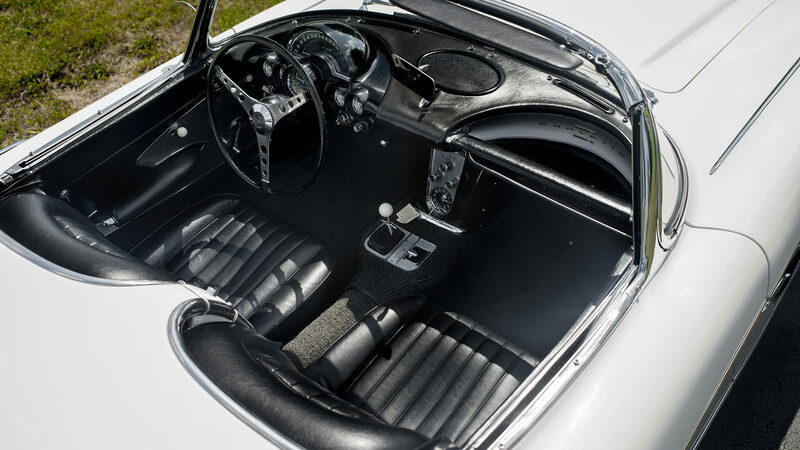 Creating a sports car isn’t just a case of putting a big engine in a lightweight car; the interior has to be a driver’s interior with great instrumentation and a suitable sports steering wheel. In 1951 GM designer Harley Earl was able to persuade management that a GM sports car was a great idea. He was given the go ahead to create a prototype and it was called the EX-122 and was shown at the GM Motorama at the New York Waldorf Astoria in 1953. Potential customer reaction was positive so GM decided on a limited production run using fiberglass body panels and existing Chevrolet mechanicals including the six cylinder “Blue Flame” engine that was around the same size as the six cylinder engines in the Jaguar XK120 and the Nash-Healey. 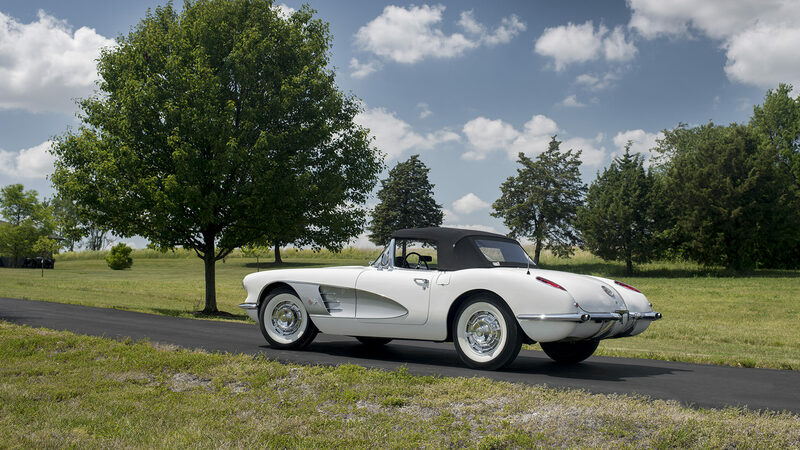 By 1960 Chevrolet had got the Corvette right. Quality control was excellent, power to weight ratio was good, and the car had acquired an iconic styling that would make it a household name. 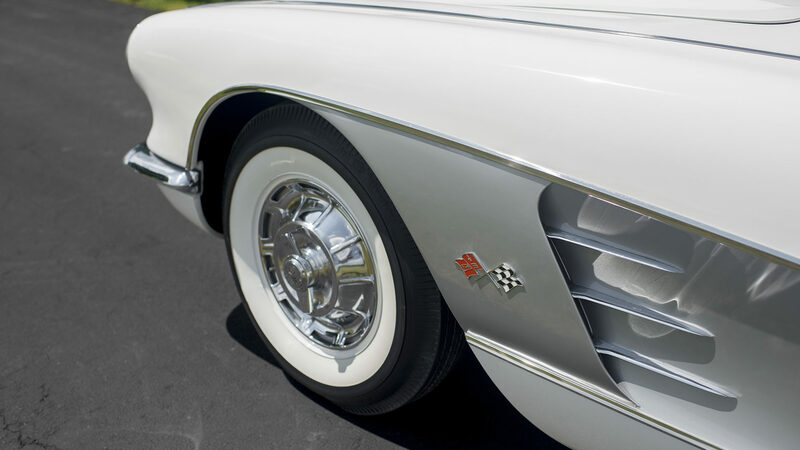 The early Corvettes suffered from poor quality control in their fiberglass bodywork even having doors come open unexpectedly in corners; they were underpowered and only came with an automatic transmission. GM management were ready to throw in the towel and give up on the Corvette but in 1955 Ford introduced their two seater “personal luxury car” the Ford Thunderbird and suddenly and quite unexpectedly GM needed a car to compete against that and the Corvette was the best thing they had. By this stage GM had hired a Russian engineer named Zora Arkus-Duntov and he had presented a proposal paper to management titled “Thoughts Pertaining to Youth, Hot Rodders and Chevrolet“. This paper was to set the course for Chevrolet to become the performance brand for General Motors and the Corvette was to be the vehicle by means of which that was to be achieved. 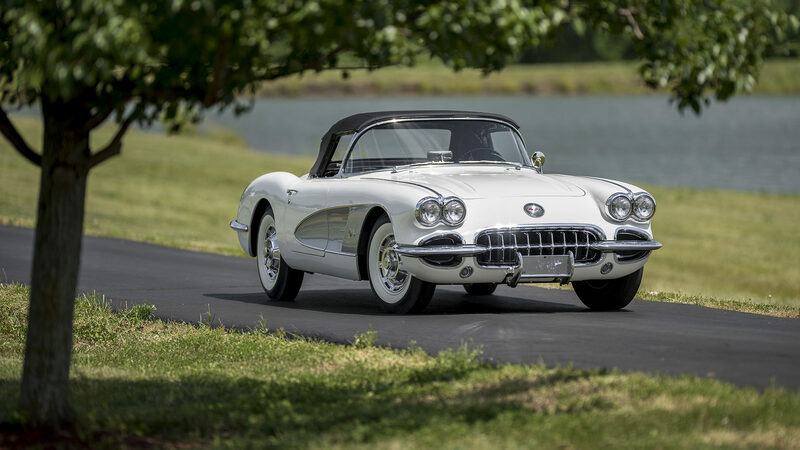 To compete with the Ford Thunderbird the Chevrolet Corvette needed to deliver the style and luxury of the T’bird, but also deliver performance to outstrip it. Between Zora Arkus-Duntov and GM engineer Ed Cole the way was made for the Corvette to get a small block Chevrolet V8 dropped into it and mated to a manual gearbox. Zora Arkus-Duntov got some needed publicity by driving a V8 Corvette to a full 150mph flying mile at Daytona Beach and by setting a new Stock Car record at Pikes Peak in 1956. Not content with that by 1960 the Corvettes were taken to the prestigious 24 Hours Le Mans where they surprised the world with just how capable they were. 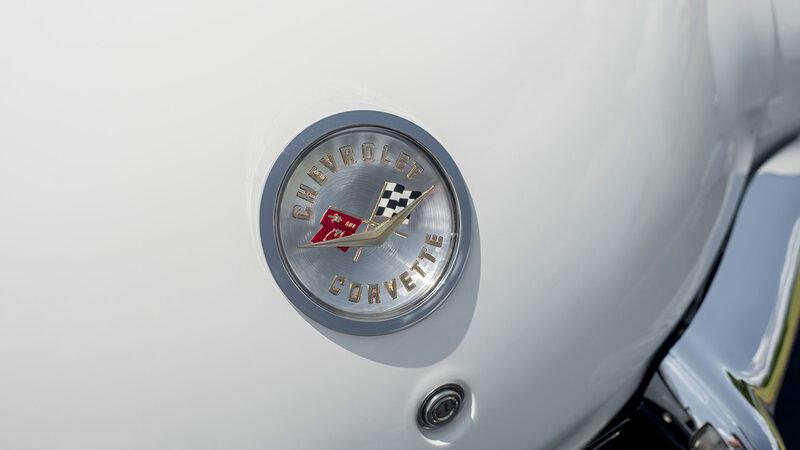 The Corvette had established itself as a credible and desirable sports car on the world stage and in the process had become one of the most desirable American cars ever created. 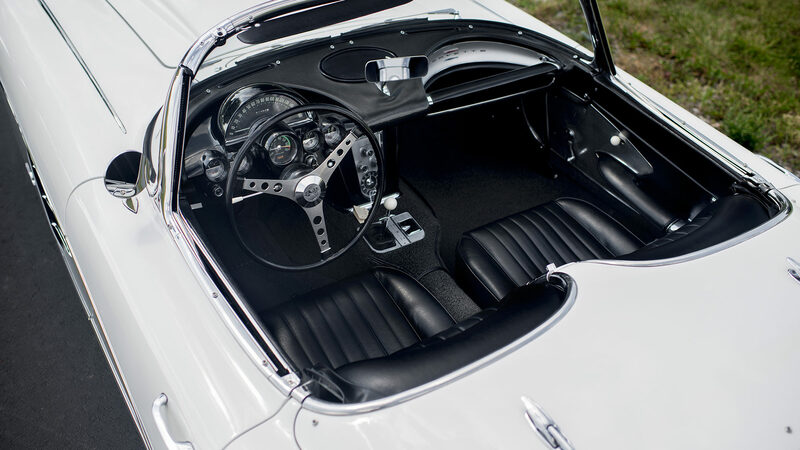 Amongst its desirable factory fitted options this 1960 Corvette has the vinyl dashboard cover. The white 1960 Chevrolet Corvette in our pictures is a Bloomington Gold Certified automobile which has received a NCRS Top Flight Award. This car is fitted with the 283cu. in. 270hp V8 engine, four speed manual transmission, dealer-installed cockpit cover, dual 4-barrel carburetors, 6500 RPM red-line tachometer, and Positraction rear end. The car is fitted with a Wonderbar radio, and a Harrison aluminum radiator which improves engine cooling considerably. The car has been restored and sports a new Al Kloch interior but every effort has been made to keep the car original to the extent that it has its original glass. The standard of the finish of this car is evident in the photos. This Corvette is coming up for sale by Mecum Auctions at their Denver 2017 auction to be held over July 20-22, 2017. This Corvette is to be sold without reserve. If you are looking for an American icon, and American legend, made the same year as the famous Le Mans entry, then this is a car that should be seriously looked at.